This Congress Centre displays 5 meeting rooms (up to 500 seats) with natural lighting. In particular, two of the rooms are communicating, and can be therefore utilised as a unique, larger congress room. Interpreting and secretariat services as well as technical ones ( video projectors etc.) are available. All meeting rooms are supplied with wi-fi technology and can host congress, press conferences, product launch and many other professional receptions. 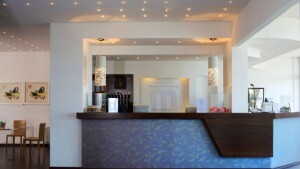 The restaurant Afrodite provides catering assistance with a wide range of menues from coffee-breaks to gala dinner.